Day Three, 9.30 am, in the Suite 230 at the Arthur Ashe Stadium. The world’s No.7 coffee roaster arrived at the US Open, first time in their illustrious history! 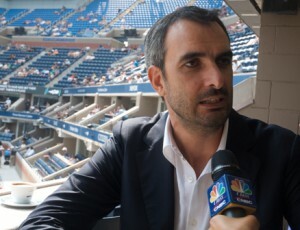 By an exclusive media reception, www.db4tennis.com had a chance to meet the highest level leaders of the Italian company. Francesca Lavazza, the Company’s Corporate Image Director and Marco Lavazza, the vice-president gladly provided information regarding the medium and long-term strategy and objectives of the company as well as answered the questions of the media. Francesca Lavazza emphasized that the year of 2015 is very important in both foreign and domestic presentation of the company. She pointed out that the Lavazza opened in the Italian Pavilion at Milan Expo 2015 and also this is the kickoff year of introducing Lavazza for the tennis world. 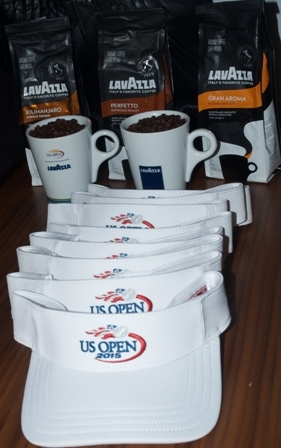 In its first year of a multi-year agreement with The United States Tennis Association (USTA), Lavazza will bring the flavor of authentic Italian coffee to the USTA Billie Jean King National Tennis Center for the hundreds of thousands of fans attending this year’s US Open (August 31st to September 13th). To further support tennis, Lavazza has partnered with top-ranked women’s tennis star, Caroline Wozniacki. As the official coffee of the US Open, Lavazza will be integrated into the on-site food and beverage experience within the USTA Billie Jean King National Tennis Center in two new Lavazza Cafes, concessions, restaurants, suites, player and media lounges, and all other hospitality areas. 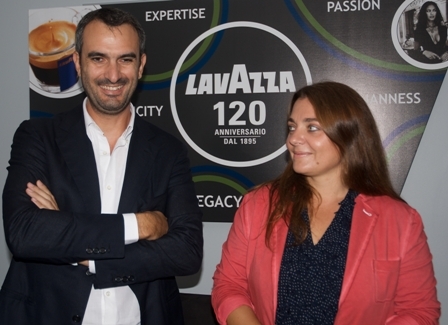 Lavazza will also host a promotional space to educate and engage with consumers on the grounds and offer guests product samples to enjoy at home. Lavazza’s Mobile Cafe will serve up complimentary coffee and espresso throughout Manhattan (September 2nd – 4th), including at the Bryant Park 7 Train stop as tennis fans make their way to the stadium for the morning matches. This partnership with the US Open represents the company’s largest tennis sponsorship in North America, which also includes the BNP Paribas Open in Indian Wells, CA and the Rogers Cup in Canada. Vice Chairman and 4th generation family member, Marco Lavazza, comments: “Since the US is a very important market for us, we have chosen to introduce the Lavazza experience to tennis fans throughout the US Open, our third Grand Slam tournament partner. 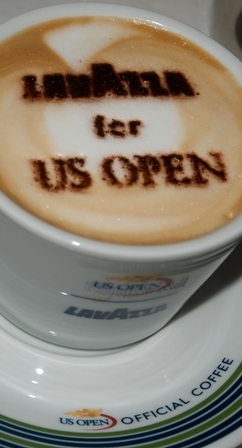 Tennis and coffee share many common ideals, among them tradition, innovation, international scope and, first and foremost, passion.” Lavazza’s presence at the US Open tournament provides the opportunity to serve authentic Italian coffee to over 700,000 tennis spectators and players. 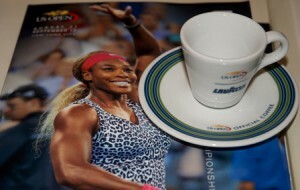 coffee of tennis lovers worldwide. This year Lavazza looks forward to introducing the classic Italian coffee break – which has become an honorary icon of Wimbledon – to US Open tennis fans as they watch and comment on the spectacular shots of the champions on the courts. 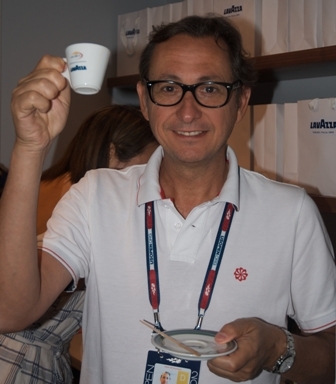 Benito Perez-Barbadillo, the PR/Publicist of Rafael Nadal also participated at the reception and tasted the varios aroma of Lavazza coffee along with the members of the media. The two coffee maker specialists (il maestro Salva- tore and il maestro Francesco) brewed excellent coffee for us. 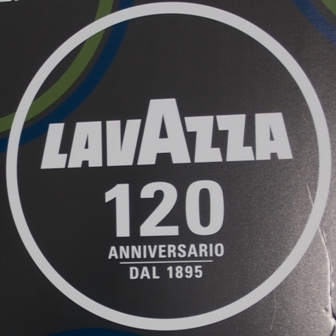 Established in Turin, Italy, in 1895, Lavazza has been owned by the eponymous family for four generations. The world’s seventh ranking coffee roaster, Lavazza is the retail leader in Italy with a market share of approx. 45% (Nielsen), sales of EUR 1,344 million in 2014, and a growing presence in North America. The company has five manufacturing plants, and markets its products in more than ninety countries, through wholly owned subsidiaries and distributors. In its early years, the founder Luigi Lavazza invented blending – the art of knowingly combining different origins sourced from some of the best coffee producing areas in the world – and this continues to be a distinctive feature of many Lavazza products. The company has over a quarter century of experience in the manufacture of portioned coffees (single-serve) and systems. Lavazza’s North American headquarters are in New York City. In 2015, in partnership with Argotec and the Italian Space Agency, Lavazza became the first company to serve authentic Italian espresso in outer space with the ISSpresso capsule system. In addition to its exclusive coffee partnerships at five of the world’s top tennis tournaments (Wimbledon, Roland Garros, US Open, BNP Paribas Open, and Rogers Cup), Lavazza is the official coffee at the Italy Pavilion, Expo 2015, and an official partner of the Solomon R. Guggenheim Foundation and its New York museum. For more information on Lavazza, log on to lavazza.com, “like” the official Facebook page, facebook.com/lavazza, or follow @lavazzausa on Twitter.